I can't create a new sub task in all tasks view under the parent task. This means you can not have a sort set for that view. Update your sort and choose None. Other views you can use the sort options as needed but the main view in a task list needs to be unsorted to retain the relationship between parent / child tasks. 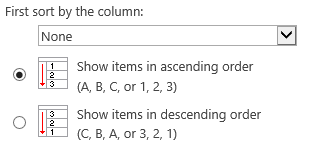 Remember even if you don't have sort for the view you can still use the column headers to manually sort or filter the items. Just expand on Chris's answer - he's right. Some functions on certain lists don’t work if your default view is grouped, sorted or filtered. Case in point: in the Tasks web part, if you try to indent tasks in the filtered view (i.e. My Tasks) – you will get the following error message: We can’t modify hierarchy on a view that is sorted/filtered/grouped. As a result, don’t change that default view in SharePoint. If you decide to view information differently, you should create your own custom views. Not the answer you're looking for? Browse other questions tagged sharepoint-server 2016 task-list or ask your own question.